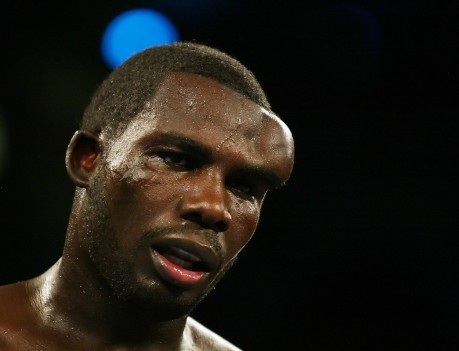 Headbutts and cuts are common occurrences in boxing. They’re expected and learning how to deal with them is essential for the fighter, and their corner. However, there are times when injuries sustained as a result of a punch or head clash, is virtually impossible to deal with. Some of the worst injuries in boxing are seen in the following fights. When this fight was initially made, many of the media and public thought it was a joke. It was clear that the great Erik Morales’ best days were far behind him, having won only 3 of his last 7 fights against low level opposition. Marcos Maidana was arguably the hardest puncher in the 140lbs division and was on the rise. Out of 29 fights, 27 of them were by knockout and his two losses were close against decent competition. However, Morales believed in himself and asked for the fight with Maidana, which at the time seemed suicidal. Maidana came out fast and hard and immediately put Morales on the back foot. 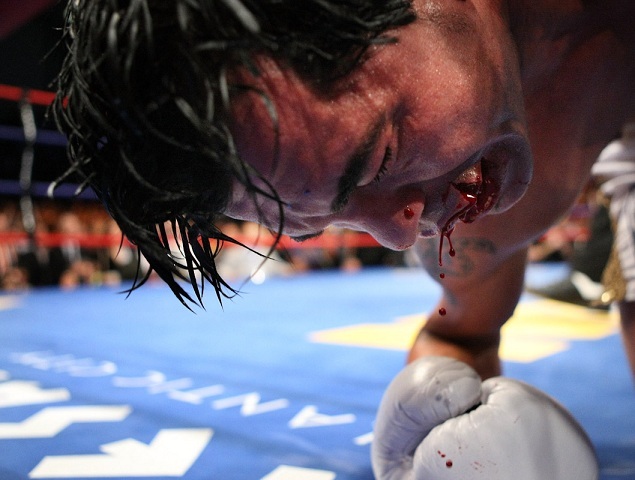 An uppercut landed in the first round and Morales’ eye began to swell up. It seemed as though everyone was right, that it was only a matter of time before Morales was going to be blown away. As the rounds went by, Morales was using his superior technique to defend and counter against the powerful punches from the Argentinian. 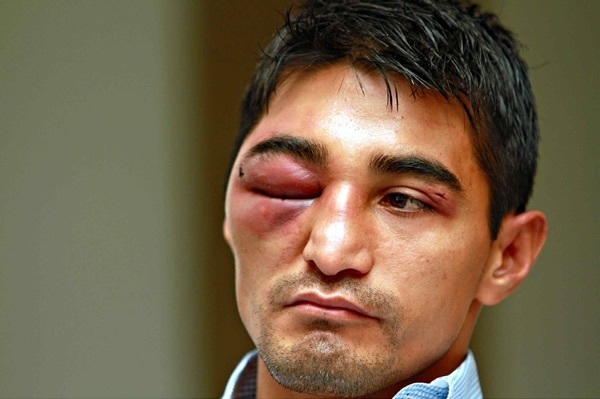 However, he couldn’t defend against all of them and eventually, the swelling on his eye got so bad that from round 4 onwards, Morales was fighting with only one eye. What was so amazing is that not only did Morales survive the onslaught by a younger, fresher, harder punching opponent, but he was fighting back and hurting Maidana on several occasions all while only having one good eye. Morales did this for the entire 12 rounds and although it wasn’t enough to win him the fight, he won the event and proved everyone wrong. The huge swelling on his right eye is a testament to Morales’ fighting spirit and huge heart. Hasim Rahman shocked the world when he came in as a 20-to-1 underdog against Lennox Lewis, and spectacularly knocked Lewis out with one punch in the 5th round. In the immediate rematch, Lewis got revenge and knocked Rahman out this time in the 4th round. Rahman needed an impressive comeback fight to get back in the world title picture. He was going to go up against an aging former champion Evander Holyfield. Holyfield, who has a history of using his head to inflict damage to his opponents, would unintentionally use it again against Rahman. As soon as he did, Rahman’s head began to swell immediately and by the 8th round, there was a lump on his foreman the size of a baseball (severe hematoma). It didn’t help that Holyfield kept on aiming for it, so shortly after, a ringside doctor was called in and put an end to the fight, and also the grotesque swelling on Rahman’s forehead. Arturo Gatti (R.I.P – April 15, 1972 – July 11, 2009) was a warrior in every sense of the word. He had been through so many wars in the ring that by the time he fought Alfonso Gomez, he had little left to offer, except for his huge heart. It was evident in the fight that he was a shell of his former self, and Gomez took advantage of that. 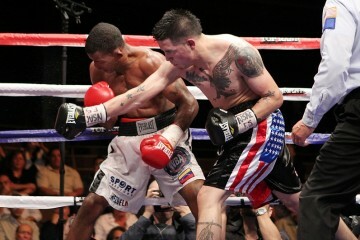 He let off hard shots throughout the entire fight and bossed Gatti about. In round 7, Gatti was backed onto the ropes and Gomez let off a huge overhand right that landed right on Gatti’s chin, which dropped him to his knees. 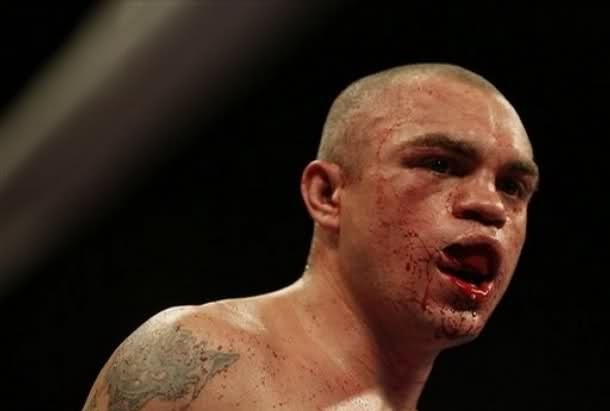 Gatti was left with a huge tear on his upper lip which was profusely dripping blood, and before he could beat the count, ring officials came in to stop the fight. 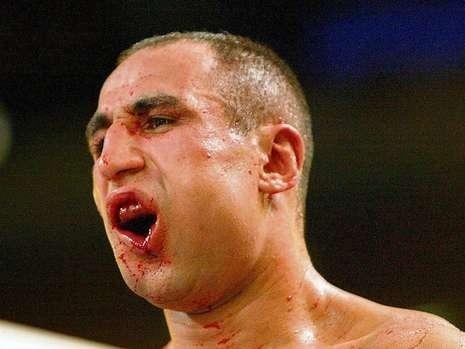 In 2006, the IBF Middleweight Champion was German based Armenian, Arthur Abraham. 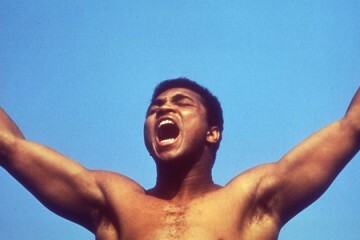 He was a rugged and tough fighter with immense power in both hands. He was to defend his title against another tough fighter also with huge punching power, the Colombian named Edison Miranda. The match up was a war on paper, and it lived up to the hype in the ring. The fight was filled with dirty tactics from Miranda, and Abraham had his jaw broken in two places in round 4. Despite this incident, Abraham continued to fight on while being hit by a huge puncher. It was a brutal fight and Miranda was deducted 5 points for repeatedly landing low blows as well as an intentional headbutt. Throughout all the pressure and pain Abraham had to endure, he still came out as the winner. After the fight, Abraham had an operation on his broken jaw with 22 screws placed into two titanium plates, but this only just enhanced his reputation even more. Evander Holyfield caused a massive upset when he stopped Mike Tyson in their first fight. However, in their second fight, it would be stopped for a completely different reason. Mike Tyson produced one of the most infamous incidents in the entire sporting world which tarnished the reputation of boxing. Holyfield, who was known for using headbutts in fights, whether intentionally or not, would use it against Tyson in just round 2, which opened a large cut over his right eye. Growing frustrated with headbutts and not being able to hurt Holyfield, Tyson would resort to an entire different matter. 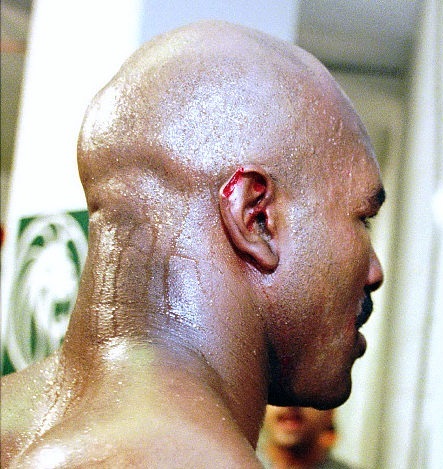 During one of the clinches in the 3rd round, Tyson placed his head over Holyfield’s shoulder and bit his right ear, taking an inch piece of cartilage from the top, and then spitting it back onto the canvas. After several minutes delay, the ringside doctor deemed that Holyfield was able to continue so the fight resumed. Shortly after, there was another clinch and once again, Tyson bit Holyfield on his other ear to which Holyfield threw his arms up and down in a rage. It was the end of the round and it was clear there was no point continuing the fight, which lead to the disqualification of Mike Tyson. Vitali Klitschko received a lot of criticism when he retired in his corner against Chris Byrd. At the time, he was one of the top stars of the division and had 27 wins all by knockout. His reputation was severely tarnished because he suffered a serious shoulder injury (later found out to be a torn rotator cuff) and found it too painful to continue, even though he was comfortably winning the fight. Vitali was aiming for redemption in his next fight against the great Lennox Lewis, who was far from his prime. Coming in as a 4-to-1 underdog, Vitali would go to war with Lewis from the get go. Both fighters landed hard flush shots but it was Lewis who would do the most damage by opening a deep cut to Vitali’s left eye. 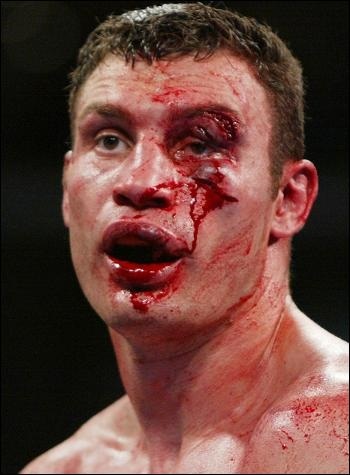 Lewis continued to target the badly cut eye and by the end of round 6, Vitali’s eye was a complete mess. Despite Vitali’s pleas to continue, the doctor stopped the fight because if struck again, his eye could be permanently damaged. Although Vitali lost the fight via TKO, he won the event and also regained his reputation. In a slugfest and one of the best fights of 2011, both American based fighters, Pawel Wolak of Poland and Delvin Rodriguez of Domincan Republic, got into a terrific war on ESPN’s Friday Night Fights. In a small but rowdy crowd, both fighters went toe-to-toe but it was Wolak who was pressing the action, and Rodriguez content with utilizing his counter-punching skills. 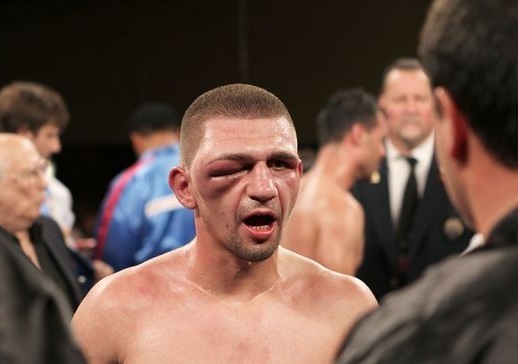 By the 7th round, Wolak’s right eye was massively swollen and practically shut but this didn’t deviate him from his game plan, which was to continue to apply pressure. Wolak showed a granite chin and heart but was eating too many shots, which only worsened his eye. The fight ended in a draw and Wolak ended up with a grotesque right eye. Everyone in the boxing world knows about the infamous hand wrapping scandal that Antonio Margarito was involved in. However, nobody knows how long he’d actually been using ‘plaster of paris’ for before he was caught attempting to use them in his mega fight against Shane Mosley. 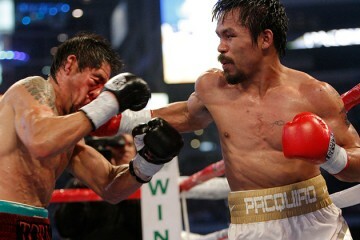 Evidence can be pointed towards Margarito’s 2005 fight with Sebastian Lujan. 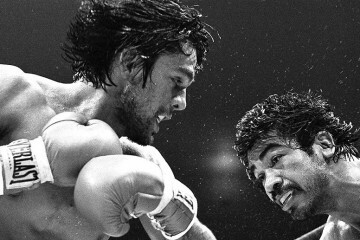 Margarito’s relentless pressure and body shots were hurting Lujan but it was his ear that caught the attention of the referee which forced his corner to stop the fight. 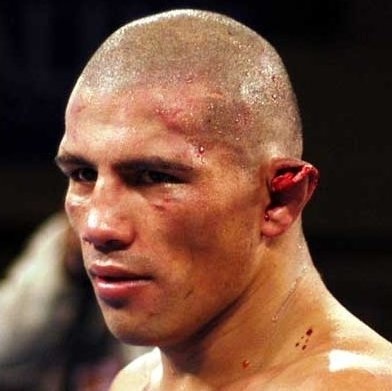 Lujan’s left ear was literally hanging off the side of his head which has led many to believe that Margarito used illegal hand wraps for this fight also. In June 2006, two of the best light-welterweights in the world met to produce an exciting fight. Both were undefeated, both were world champions and both had plenty of skill and heart. However, Cotto was the powerful punching pressure fighter while Malignaggi was the speedy, light punching pure boxer. Cotto opened a cut over Malignaggi’s right eye in only the first round which affected his performance during the course of the fight. Cotto’s stalking and power was too much for Malignaggi and he would suffer a fractured right orbital bone and damaged jaw because of this. 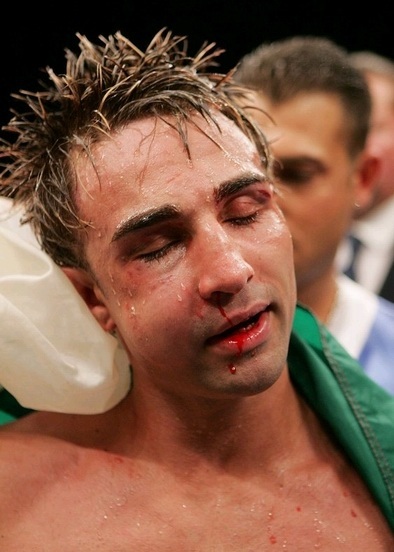 However, despite these injuries, Malignaggi didn’t quit and fought to the end, and although he lost, he won many fans over and put up a good fight, losing only by a few rounds on each scorecard. In his last ever win in his boxing career, Rocky Juarez stopped Jorge Barrios in the 11th round of their fight. 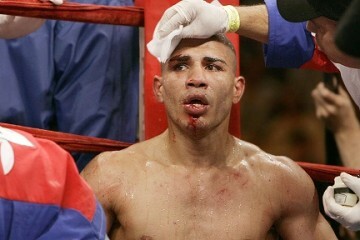 Barrios who was a former Junior Lightweight World Champion suffered a horrific cut on his upper lip against Juarez. After taking several shots and then a right hand that knocked him off balance and onto the canvas on his backside. Barrios stood up ready to fight again. However, as the referee was counting, he saw the obvious piece of meat hanging off Barrios’ upper lip and called the ringside doctor over, to which the fight was immediately stopped. Find out 10 Ways On How To Prevent Injuries.